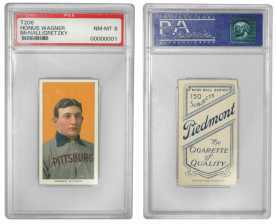 The finest known T-206 Honus Wagner card is among the $8 million of collectibles that will be displayed by PSA at The National Sports Collectors Convention, July 27 - 31, 2005, in Rosemont, Illinois. Photo courtesy of PSA. One of the world's most valuable and famous sports items, the renowned 1909-era Honus Wagner baseball card, will be part of an $8 million exhibit of famous collectibles at the National Sports Collectors Convention in Rosemont, Illinois, July 27 - 31, 2005. Professional Sports Authenticator (PSA) of Newport Beach, California, the world's largest sports memorabilia authentication service, will exhibit the Wagner "tobacco" card formerly owned by hockey star, Wayne Gretzky, and later purchased for $1.3 million at an auction in 2000, according to Joe Orlando, President of PSA, a division of Collectors Universe, Inc. (NASDAQ: CLCT). The multi-million dollar exhibit will include some of the finest known baseball cards of Ted Williams, Ty Cobb, Babe Ruth, Willie Mays, Lou Gehrig and Shoeless Joe Jackson from the fabled sports card collection of entertainment industry attorney, John Branca. 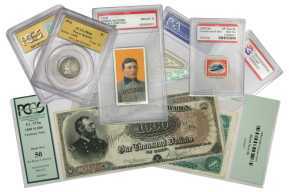 In addition, PSA and Collectors Universe will display the legendary 1913 Liberty Head nickel that recently sold for more than $4 million; a $1,000 denomination 1890 U.S. Treasury note valued at more than $1 million and nicknamed the "Grand Watermelon" because the three large green zeroes in the printed denomination resemble watermelons; and a 1918 "Inverted Jenny" airmail postage stamp misprinted with an upside down bi-plane in the design. The 24-cent denomination stamp recently sold for $577,500. 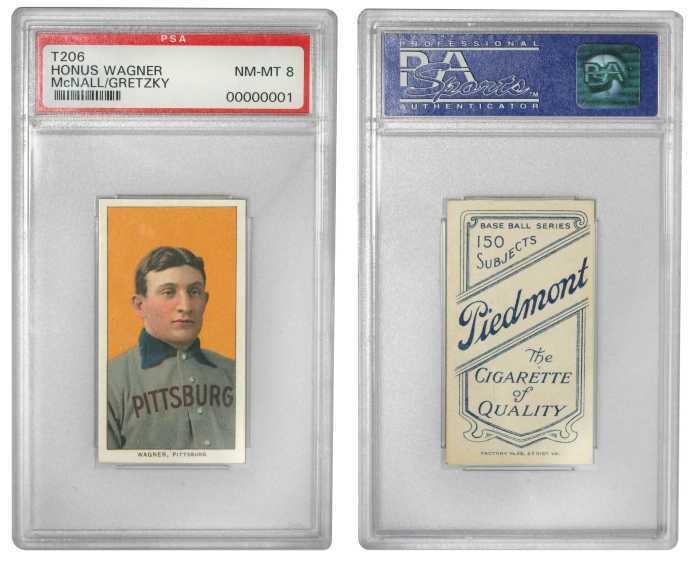 An $8 million display of some of the finest known collectibles certified by Collectors Universe, including the highest-graded T-206 Honus Wagner card, will be exhibited by PSA during The National Sports Collectors Convention in Rosemont, Illinois, July 27 - 31, 2005. Photo courtesy of PSA. "Each of these collectibles is the finest known of its kind, according to Collectors Universe," said Orlando. "This will be the first time they've ever been exhibited together." "Several of these historic items are stored at our vaults in California, and the owners have graciously permitted us to display them for sports fans attending the convention. Collectors Universe authenticates and grades the world's finest collectibles, and these famous items will be part of an $8 million collectibles exhibit." The exhibit will be at the PSA booth (#529 in the Corporate Area) of the 26th National Sports Collectors Convention at the Donald E. Stephens Convention Center, in Rosemont, Illinois. For additional information about Professional Sports Authenticator, contact PSA, P.O. Box 6180, Newport Beach, CA 92658. Phone: (800) 325-1121. Web: www.PSAcard.com. E-mail: info@PSAcard.com.